Recently Shaun Meehan, GB’s General Manager – SA, participated in the Pain Revolution Ride, a 7-day cycle tour from 16-23 March 2019 in Tasmania. This was Shaun’s third year of participation in the event, which aims to raise much needed funds for research to improve the treatment of persistent chronic pain and increase awareness of the impacts of persistent pain on society. We thought that this is a great time to look at chronic pain from a psychological perspective, how it may impact employees and how employers can support employers with chronic pain. It’s estimated that one in five Australians is experiencing chronic pain. For employees suffering from chronic pain, it’s not only about the physical limitations and struggles. There is also a psychological aspect as well. According to Lorimer Moseley, Professor of Clinical Neurosciences and Chair in Physiotherapy at the University of South Australia, the brain is a pain output. With Moseley’s theory, acute pain is generally accepted as being due to tissue damage; however, even with severe pain, pain is output. Since chronic pain lasts longer than it should, according to Moseley, it’s less about tissue and more about maladaptive output from the brain. Take some time to watch Moseley’s TEDx presentation Why Do We Hurt? This is an easy to understand video that explanations why we hurt, and the helpful ways that our brain is telling us about danger when we feel pain. How does this impact employees in the workplace? As chronic pain is invisible, a person experiencing this condition may feel stigmatised and misunderstood by their co-workers. This can make the workplace a challenging environment. According to Pain Australia, the condition is responsible for approximately 9.9 million absent days from work per year and a total cost of lost productivity of about $11 billion per annum. 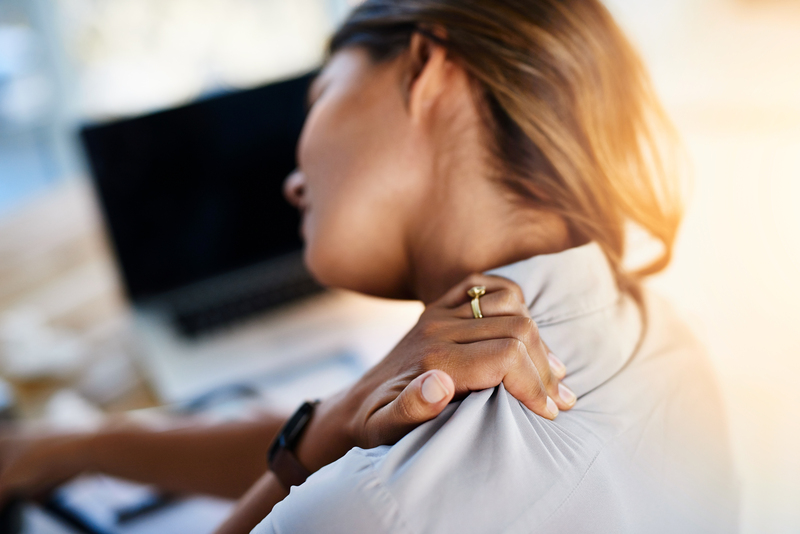 It is therefore important for employers to be aware of the impacts of chronic pain and how to implement strategies to best support employees experiencing this condition. Provide psychological counselling, coupled with workplace support: Showing support in the workplace is wonderful, but employers should consider having additional, professional assistance. Someone that has experience with the emotional issues that can surround those that suffer from chronic pain. Provide resources: Foster a supportive workplace environment and build awareness about chronic pain and its challenges. Education is key. Providing information, in the form of posters on the walls (design your own here! ), meetings, and printed materials can help to teach others about chronic pain. Show physical support: The employer should consider conducting an ergonomic assessment of the employee’s workspace. This may highlight any necessary modifications, which can assist the employee to feel more comfortable at work. Encourage workers to take precautionary steps: If an employer is aware that a worker has chronic pain, they should help them to take care of themselves first, so that they can then do the tasks required of them. Encouraging them to stay active, know their limits, make social connections, follow prescriptions carefully, and above all, to not lose hope. Implementing these strategies can significantly improve the well-being of employees experiencing chronic pain. With chronic pain being responsible for approximately 9.9 million absent days from work each year, making a few of these changes can improve the productivity of employees across an organisation. One of the best things employers can do is raise awareness of chronic pain. A great way to do that is by educating workers. Use this link to create your own poster today, and place in prominent places to be read and used as a reference by workers.